This book examines the strategic interactions among China, the United States, Japan, and Southeast Asian States in the context of China’s rise and globalization after the cold war. Engaging the mainstream theoretical debates in international relations, the author introduces a new theoretical framework—institutional realism—to explain the institutionalization of world politics in the Asia-Pacific after the cold war. Institutional realism suggests that deepening economic interdependence creates a condition under which states are more likely to conduct a new balancing strategy—institutional balancing, i.e., countering pressures or threats through initiating, utilizing, and dominating multilateral institutions—to pursue security under anarchy. 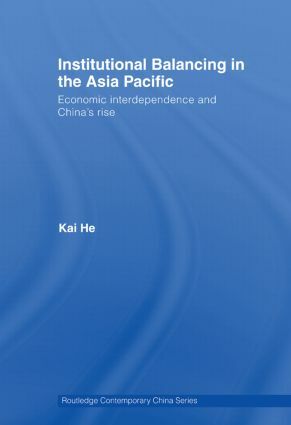 To test the validity of institutional realism, Kai He examines the foreign policies of the U.S., Japan, the ASEAN states, and China toward four major multilateral institutions, Asia-Pacific Economic Cooperation (APEC), the Association of Southeast Asian Nations (ASEAN) Regional Forum (ARF), ASEAN Plus Three (APT), and East Asian Summit (EAS). Challenging the popular pessimistic view regarding China’s rise, the book concludes that economic interdependence and structural constraints may well soften the "dragon’s teeth." China’s rise does not mean a dark future for the region. Institutional Balancing in the Asia Pacific will be of great interest to policy makers and scholars of Asian security, international relations, Chinese foreign policy, and U.S. foreign policy. China’s institutional balancing: Peaceful rise?